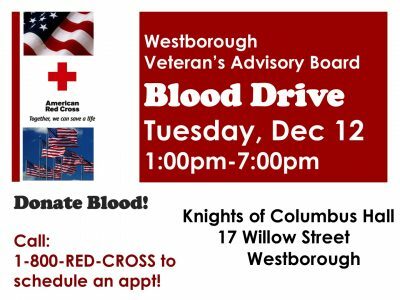 THE WESTBOROUGH VETERANS ADVISORY BOARD IS SPONSORING A BLOOD DRIVE TO BE HELD ON DECEMBER 12, 2017, AT THE KNIGHTS OF COLUMBUS HALL, 17 WILLOW STREET, WESTBOROUGH FROM 1PM TO 7PM. IN ADDITION TO THE NEED FOR DONORS, WE ARE SEEKING VOLUNTEERS TO MAN THE DESK FOR POST DONOR DONATIONS, IF YOU CLICK ON THE FOLLOWING LINK IT WILL BRING YOU TO THE SIGN-UP SECTION. WE NEED TWO VOLUNTEERS PER HOUR. WE HAD A GREAT RESPONSE TO OUR JULY BLOOD DRIVE AND ARE HOPEFUL TO EXCEED THE JULY RESULTS. THE WESTBOROUGH VETERANS ADVISORY BOARD REALLY APPRECIATES YOUR PAST SUPPORT OF VETERANS AND WE LOOK FORWARD TO MAKING THIS A SUCCESSFUL DRIVE WITH YOUR SUPPORT.